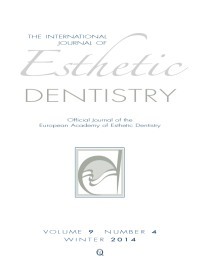 Clozza, Emanuele / Suzuki, Takanori / Engebretson, Steven P.
Treatment of multiple recession defects with the adjunct use of a connective tissue graft (CTG) represents a challenge when diagnosed in several teeth of the mouth. The amount of CTG harvested from the palate may not be adequate to address this condition. In such scenarios, alternative sources such as acellular dermal matrix (ADM) are preferred due to the unlimited availability. A case report is presented, dealing with the treatment of multiple gingival recessions affecting the majority of dentition using ADM, with a 6-month follow-up. When planning a prosthetic rehabilitation of a periodontally compromised case, the clinician is often confronted with difficulties and dilemmas related to selecting the appropriate treatment that would provide long-term successful outcomes in function and esthetics. In such cases, a correct diagnosis and prognosis of the intraoral situation supported by evidence-based dentistry is the basis for the establishment of a proper treatment strategy. In this second part of a two-part treatment planning series, a systematic approach of patient examination and prognosis of each tooth is presented. Furthermore, different removable and fixed treatment possibilities are described and the rationale governing the decision-making process is revealed. The execution of the final treatment plan as specified by the concept of comprehensive dental care is outlined, and the final outcome is discussed according to the literature. The palate, maxillary tuberosity and edentulous ridges are generally used as the donor sites for connective tissue grafts. This article shows the use of vestibular soft tissue of a tooth in the coverage of localized gingival recession. The vestibular unit was harvested during crown lengthening procedures, sutured over the denuded root surface, and covered with a coronally advanced flap without vertical incisions. The healing was uneventful with complete coverage of the recession up to 18 months. The vestibular unit of a tooth can serve as the donor area for a connective tissue graft in the coverage of gingival recessions, resulting in stable outcomes. The aim of this article was to report the clinical case of a male patient of 20 years with hyperpigmented gingiva and moderate fluorosis, whose smile was reestablished by the use of a laser assisted depigmentation procedure, an enamel microabrasion technique, followed by at-home bleaching and subsequent remineralization therapy. The association of these techniques presented excellent results and the patient was satisfied. All techniques are painless, fast and easy to perform, in addition to preserving the hard and soft dental structure. Treatment showed immediate and permanent results; these techniques must be divulged among professionals and their patients. Objective: The aim of the study was to characterize the elemental distribution at the interface between all-ceramic core and veneering porcelain materials. Materials and methods: Three groups of all-ceramic cores were selected: A) Glass-ceramics (Cergo, IPS Empress, IPS Empress 2, e-max Press, Finesse); B) Glass-infiltrated ceramics (Celay Alumina, Celay Zirconia) and C) Densely sintered ceramics (Cercon, Procera Alumina, ZirCAD, Noritake Zirconia). The cores were combined with compatible veneering porcelains and three flat square test specimens were produced for each system. The core-veneer interfaces were examined by scanning electron microscopy and energy dispersive x-ray microanalysis. Results: The glass-ceramic systems showed interfacial zones reach in Si and O, with the presence of K, Ca, Al in core and Ca, Ce, Na, Mg or Al in veneer material, depending on the system tested. IPS Empress and IPS Empress 2 demonstrated distinct transitional phases at the core-veneer interface. In the glassinfiltrated systems, intermixing of core (Ce, La) with veneer (Na, Si) elements occurred, whereas an abrupt drop of the core-veneer elemental concentration was documented at the interfaces of all densely sintered ceramics. Significance: The results of the study provided no evidence of elemental interdiffusion at the core-veneer interfaces in densely sintered ceramics, which implies lack of primary chemical bonding. For the glass-containing systems (glassceramics and glass-infiltrated ceramics) interdiffusion of the glass-phase seems to play a critical role in establishing a primary bonding condition between ceramic core and veneering porcelain.